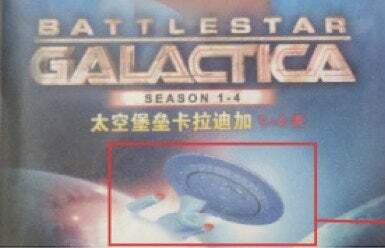 Black-market Battlestar DVD calls the show a "tween comedy"
The cover to this presumably pirated Battlestar Galactica DVD is full of little treasures, from the back box quotes to the front cover. Which just so happens to have a picture of the U.S.S. Enterprise on it. Full version below.